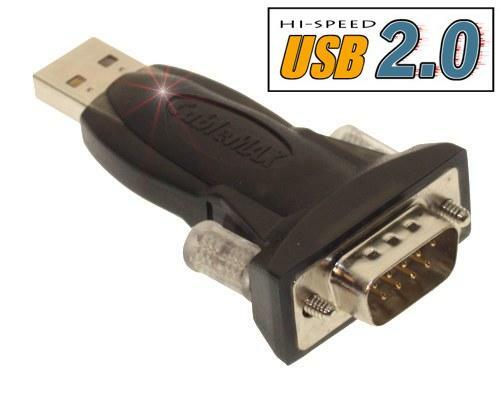 New USB 2.0 Serial Adapter with Built in Drivers for XP and 2003 and New Windows Vista!. Ultra Compact Mini USB 2.0 Serial RS-232 Adapter cable for NoteBook and Laptop Users. Mini Adapter has one Status LED and uses FTDI Chip for up to 230K Speed. Converts a USB port into a 9-pin male RS-232 serial port capable of speeds up to 230,400 bps. speeds up to 921,600 bps. serial devices to your system with easy plug-and-play and hot plug features. doesn't require any additional IRQ, DMA, or memory as resources on the system. or higher, Linux 2.4.0 and later, OpenBSD 2.9 and later & FreeBSD 4.7 and later. port number from the list and click OK.
under the new port number. removed from the system and re-installed. 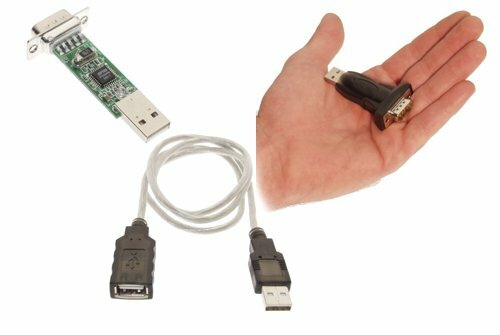 ITEM USES FTDI CHIP USB to Serial Adapter RS-232 Serial Port to USB The USB to Serial adapter (converter) from CaqbleMAX lets you use a serial PDA, GPS, cell, etc. with a standard USB port. Specifications: Item Uses Industrial Grade FTDI FT232BM Chip, for more information and driver support for this chip please see www.ftdichip.com Connectors: USB Type A Male 9-pin Serial Male Length: Adapter Direct USB to Serial Plug 2 feet (extension cable provided) Power Bus Powered (no external power required) System Requirements Windows 98 SE, ME, 2000,2003,XP,Linux (Does NOT support Mac or DOS) Pentium 233MHZ or faster 64 MB RAM or more Available USB Port Other Technical Info Ultra Fast FTDI Chip! Supports RS232 serial interface Works with USB 1.1 & 2.0 ports USB suspend condition Supports 500 kbps transfer rate Advanced 16 Bit processor for USB transaction and control data processing This adapter is the easiest way to add a serial port to your computer. Many PDAs, digital cameras, GPS units, barcode scanners, and other equipment require a serial connection, and many newer computers don't have serial ports.